The “Brass Monkey” Time Trial takes place on the 1st of January, and is different to the others in the VC Melyd and Rhyl Cycling Club’s series because it thoughtfully starts at 2pm, enabling recovery from the previous night’s New Year’s Eve celebrations (if applicable!) and enabling the event to finish before darkness falls. Another difference is that it is a bit of fun, with riders encouraged to dress up. Seen here are Steve Sharp, Andy Malcolm and Steve Lovibond. 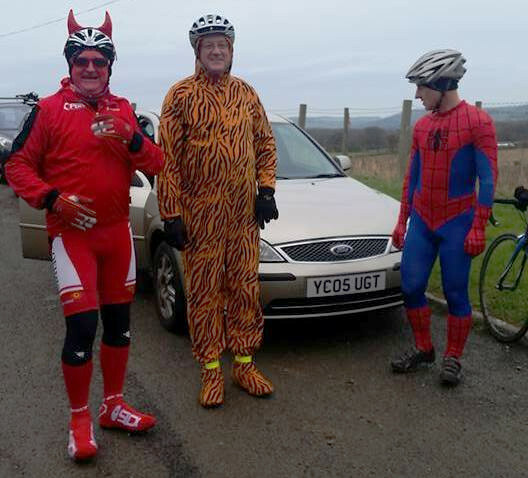 What a way to start the New Year – on the bike, fresh air, exercise with a bit of excitement and socialising thrown in. Nine miles of hell followed by relief on finishing. This year, after every rider had signed on and paid, we set off in that order i.e. first to sign on was first to start – all 23 of us. The course starts near St Marcella Church on Whitchurch Road, Denbigh. After warming up, riders stood with their in number order, nattering nervously whilst waiting to set off at one minute intervals. There is the option to be ‘held up’ by one of the volunteer helpers, with both feet clipped into the pedals, facilitating a quick get-away. Descending from the start, across the River Clwyd and then the unwelcome climb of “The Wall” to the Llandyrnog Roundabout. That’s the worst hill done. Now for the ups and downs of the road to Aberwheeler. Swiftly down to the Mold Denbigh Road and half the route is done. Quick glance at Garmin and a tad of mental arithmetic gives the realisation that at this pace last year’s time might be beaten. Keeping the left turn theme going and we are on the Denbigh by-pass. Into the wind. Struggle. Push – hard – legs – lungs – please! Last year’s time in the bag – now, can the next target be beaten? Nearly there. Last roundabout and go, go, go to the finish. Shout out number to the helpers so the time can be noted. After the riders finished, consumed mince pies, packed bikes into cars and swapped TT stories, the results are read out in reverse order by Ashley. The 2016 winner was Simon Parkinson in a time of 23 minutes 26 seconds who has custody of the trophy, until next year. A great event, full of fun and a sense of occasion as the New Year starts.